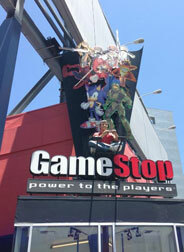 Retail stores like video game retailers or general merchandise places need ways to attract customers to their Sonic items or video games. So they use "point of purchase" type displays, cardboard standees and posters, as well as normal signs. Sega sends them out usually to advertise a new game. But, other items can be bought (somehow) by retail places. This page displays things which belonged to stores at one point. Because there aren't as many retail places as there are people, these items aren't that common. Also, keep in mind that stores are large, so to attract enough attention, the items have to be GIANT! 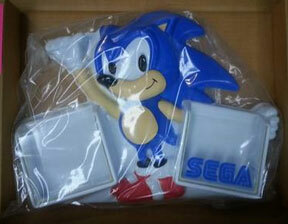 This helps their collectability as well...they make a great centerpiece for your Sonic showroom! This is an old neon sign. With this sign, the tubes of glass are bent into a sort-of Sonic shape. The top in red spells out his name. Sonic is presented in a circle, with the 1 finger up / pose. However, because neon tubes can't be bent too far & they must loop/curve around in certain ways, it's not going to be exact. You can't really tell what color it's supposed to be because it's very hard to take a photo of something that's glowing quite brightly. Since this had to be a custom work, the sign was likely expensive. Notice that it's between 2 fiberglass figures. 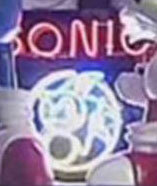 Even with the cropping, you can tell it's "hands on hips Tails" & classic Sonic from elsewhere on Retail Display Gear. Here is an old Toys R Us display from 1999. 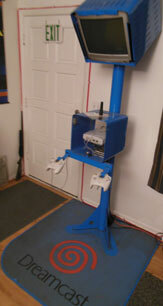 It was made to demo the Dreamcast in the store. You could lock a system, TV & controllers into it & it stood atop its own DC branded carpet you see here. This is a large retail display poster. It is big, likely about the size of a movie release poster. The glasses you see in the corners are full size (not shot or small) Posters like this are generally made out of heavier stock paper than posters for the public/general release. 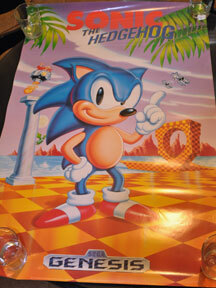 A poster like this would be given out by Sega before the game release (or at it) for retailers to use to decorate the store & promote the game. Remember, in the time of Sonic 1, there were many different offline games retail stores, not just huge ones or chains that would easily put up a poster like this. This poster is uncommon. Posters, being paper, are prone to damage, easy to throw away, and may fade in the sun. Being a retail-promo item, it also would not have had the amount of production that a regular release would, contributing to the rarity. The original artist who did the artwork has died. The original piece was thought to be a painting work, about poster size. Here is a somewhat strange kiosk display. Why is it odd? Well, first off, it's uncommon. So where was it used? Next, is that it was created specifically to demo a Dreamcast system....and that's the other odd part. 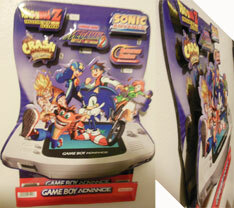 If it was for Dreamcast, why ISNT the Sonic on the cabinet Sonic Adventure style? 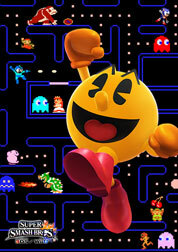 The picture of his face there is from 3D Blast, which was never even on the system. Was the display made too early, before anyone knew about the modern design? Was it too late to change it? Was it originally for Saturns & someone just 'retooled' it a little and slapped a "Dreamcast" label on there? It's partially dismantled anyway, you can see where a face-plate would have been at the top, the old 'cube style' TV is gone from it & the console hole is empty. That orange bent bar there on the front would have held the controller racks. 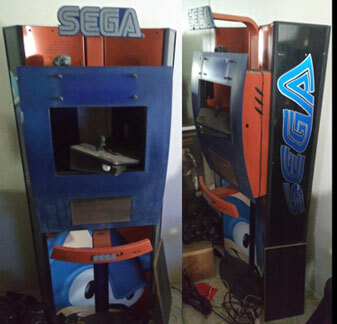 Notice the "Sega" logo is written in an underwater/wavy look on side, for some reason. Have you seen this demo kiosk in any store while it was active? You can write in with details for credit.